The Indiana governor is supposed to be the sober side of Trump-Pence, the guy who keeps cool, knows his policy brief and imposes ideological discipline on a ticket that would otherwise blow whichever way Mr. Trump puffs. But that misreads Mr. Pence’s role in this disastrous GOP season. Mr. Pence isn’t his boss’s junior political partner. He’s his moral enabler. He means “enabler” in the sense of those who facilitate drunks and drug users by making it possible for them to get by without overcoming their addiction. On Saturday, after the video eruption, Mr. Pence seemed to have his own moral awakening, refusing to serve as Mr. Trump’s surrogate at an event in Wisconsin and hinting that he might pull out of the race if his running mate didn’t express sufficient contrition at Sunday’s debate. But Mr. Pence’s moment of clarity was as short-lived as Mr. Trump’s remorse. He now claims he never considered leaving the ticket. 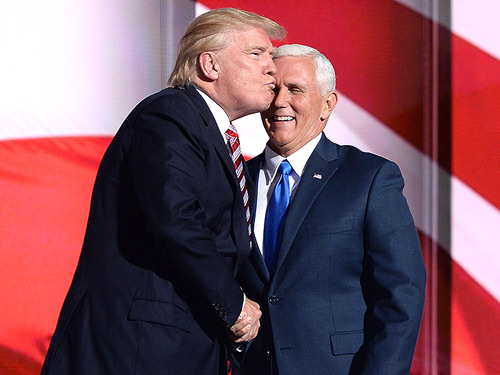 What a shame for Mr. Pence to besmirch himself through dogged fidelity to a candidate whose own notions of loyalty are as one-way as his concept of marriage. Then again, maybe I’m being too generous to the Indiana governor, whose dismay at Mr. Trump’s behavior might be as sincere as Captain Renault’s objections to gambling at Rick’s Cafe in “Casablanca.” If Mr. Pence is shocked, shocked to discover Mr. Trump is a cad, then he’s a fool. If he isn’t so shocked, he’s a cad, too. The larger question is what it says about the Republican Party that men like Mr. Pence remain willing to carry Mr. Trump to the finish line—and carry his insults, boasts, prejudices, predations, threats and lies with them. My guess is that it means the current GOP is nearly beyond redemption. On November 9, the Republican Party will have sacrificed all of its values for a cheesy, vulgar swindler who delivered the White House to Hillary Clinton. Maybe hitting rock bottom will wake it up, and it will strive for redemption. But if decisive rejection of the degeneracy and statism Trump personifies does not immediately follow, then J.D. Rucker is right; conservatives need to let the GOP die and start a new party. Serving as moral enablers would only allow it to burrow more deeply into sickness. Pence will never be clean again.